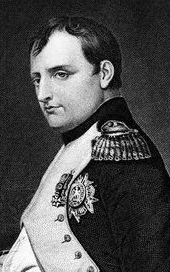 Napoleon I Bonaparte, Emperor of the French, King of Italy (August 15, 1769 – May 5, 1821) was a general of the French Revolution; the ruler of France as First Consul (Premier Consul) of the French Republic from November 11, 1799 to May 18, 1804; then Emperor of the French (Empereur des Français) and King of Italy under the name Napoleon I from May 18, 1804 to April 6, 1814; and briefly restored as emperor from March 20 to June 22, 1815. Over the course of little more than a decade, the armies of France under his command fought almost every European power (often simultaneously) and acquired control of most of the western and central mainland of Europe by conquest or alliance until his disastrous invasion of Russia in 1812, followed by defeat at the Battle of Leipzig in October 1813, which led to his abdication several months later and his exile to the island of Elba. He staged a comeback known as the Hundred Days (les Cent Jours), but was again defeated decisively at the Battle of Waterloo in present day Belgium on June 18, 1815, followed shortly afterward by his surrender to the British and his exile to the island of Saint Helena, where he died six years later. 2.1 The "whiff of grapeshot"
Although Napoleon himself developed few military innovations, apart from the divisional squares employed in Egypt and the placement of artillery into batteries, he used the best tactics from a variety of sources, and the modernized French army, as reformed under the various revolutionary governments, to score several major victories. His campaigns are studied at military academies all over the world and he is generally regarded as one of the greatest commanders ever to have lived. Aside from his military achievements, Napoleon is also remembered for the establishment of the Napoleonic Code. He is considered by some to have been one of the "enlightened despots." His vision of a united Europe did not succeed in his own time and the rivalries between Europe's competing powers and states, such as Britain, France, Germany and Russia would result in two world wars. Much later the pursuit of European Union eventually emerged. Some attribute this impulse as owing something to Napoleon's vision, which included a common infrastructure and a common legal code for his whole empire. The French Revolution had alienated the government from the Catholic Church. Napoleon negotiated the Concordat of 1801 with the Pope to bring religious and social peace to France. Napoleon appointed several members of the Bonaparte family and close friends of his as monarchs of countries he conquered and as important government figures (his brother Lucien became France's Minister of Finance). 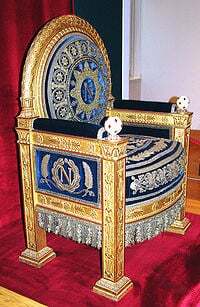 Although their reigns did not survive his downfall, a nephew, Napoleon III, ruled France later in the nineteenth century. He was born Napoleone di Buonaparte (in Corsican, Nabolione or Nabulione) in the town of Ajaccio on Corsica on August 15, 1769, only one year after the island was transferred to France by the Republic of Genoa. He later adopted the more French-sounding Napoléon Bonaparte. His family was minor Italian nobility living in Corsica. His father, Carlo Buonaparte, an attorney, was named Corsica's representative to the court of Louis XVI of France in 1778, where he remained for a number of years. The dominant influence of Napoleon's childhood was his mother, Maria Letizia Ramolino. Her firm discipline helped restrain the rambunctious Napoleon, nicknamed Rabullione (the "meddler" or "disrupter"). Napoleon's noble, moderately affluent background and family connections afforded him greater opportunities to study than were available to a typical Corsican of the time. At age nine, Napoleon was admitted to a French military school at Brienne-le-Château, a small town near Troyes, on May 15, 1779. He had to learn French before entering the school, but he spoke with a marked Italian accent throughout his life and never learned to spell properly. Upon graduation from Brienne in 1784, Bonaparte was admitted to the elite École Royale Militaire in Paris, where he completed the two year course of study in only one year. An examiner judged him as "very applied [to the study of] abstract sciences, little curious as to the others; [having] a thorough knowledge of mathematics and geography…"  Although he had initially sought a naval assignment, he studied artillery at the École Militaire. Upon graduation in September 1785, he was commissioned as a second lieutenant of artillery, and took up his new duties in January 1786, at the age of 16. 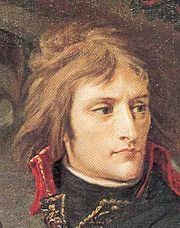 Napoleon served on garrison duty in Valence and Auxonne until after the outbreak of the Revolution in 1789 (although he took nearly two years of leave in Corsica and Paris during this period). He spent most of the next several years on Corsica, where a complex three-way struggle was playing out among royalists, revolutionaries, and Corsican nationalists. Bonaparte supported the Jacobin faction, and gained the position of lieutenant colonel of a regiment of volunteers. After coming into conflict with the increasingly conservative nationalist leader, Pasquale Paoli, Bonaparte and his family were forced to flee to France in June 1793. Through the help of fellow Corsican Antoine Christophe Saliceti, he was appointed as artillery commander in the French forces besieging Toulon, which had risen in revolt against the Reign of Terror and was occupied by British troops. He formulated a successful plan: he placed guns at Point l'Eguillete, threatening the British ships in the harbor with destruction, thereby forcing them to evacuate. A successful assault of the position, during which Bonaparte was wounded in the thigh, led to the recapture of the city and a promotion to brigadier-general. His actions brought him to the attention of the Committee of Public Safety, and he became a close associate of Augustin Robespierre, younger brother of the Revolutionary leader Maximilien Robespierre. As a result, he was briefly imprisoned following the fall of the elder Robespierre in 1794, but was released within two weeks. In 1795 Bonaparte was serving in Paris when royalists and counter-revolutionaries organized an armed protest against the National Convention on October 3. Bonaparte was given command of the improvised forces defending the Convention in the Tuileries Palace. He seized artillery pieces with the aid of a young cavalry officer, Joachim Murat, who later became his brother-in-law. He utilized the artillery the following day to repel the attackers. He later boasted that he had cleared the streets with a "whiff of grapeshot" (musket balls fired in cloth bags from the cannon, a devastating anti-personnel munitions), although the fighting had been vicious throughout Paris. This triumph earned him sudden fame, wealth, and the patronage of the new French Directory, particularly that of its leader, Paul François Jean Nicolas Barras. Within weeks he was romantically attached to Barras's former mistress, Josephine de Beauharnais, whom he married on March 9, 1796. Days after his marriage, Bonaparte took command of the French "Army of Italy," leading it on a successful invasion of Italy. At the Lodi, he gained the nickname of "The Little Corporal" (le petit caporal), a term reflecting his camaraderie with his soldiers, many of whom he knew by name. He drove the Austrians out of Lombardy and defeated the army of the Papal States. Because Pope Pius VI had protested the execution of Louis XVI, France retaliated by annexing two small papal territories. Bonaparte ignored the Directory's order to march on Rome and dethrone the Pope. It was not until the next year that General Berthier captured Rome and took Pius VI prisoner on February 20. The pope died of illness while in captivity. In early 1797, Bonaparte led his army into Austria and forced that power to sue for peace. The resulting Treaty of Campo Formio gave France control of most of northern Italy, along with the Low Countries and Rhineland, but a secret clause promised the Republic of Venice to Austria. Bonaparte then marched on Venice and forced its surrender, ending over one thousand years of independence. Later in 1797, Bonaparte organized many of the French dominated territories in Italy into the Cisalpine Republic. His remarkable series of military triumphs were a result of his ability to apply his encyclopedic knowledge of conventional military thought to real-world situations, as demonstrated by his creative use of artillery tactics, using it as a mobile force to support his infantry. As he described it: "I have fought sixty battles and I have learned nothing which I did not know at the beginning." 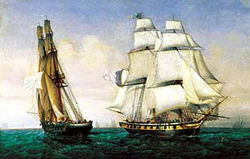 Contemporary paintings of his headquarters during the Italian campaign depict his use of the world's first telecommunications system, the Claude Chappe semaphore line, first implemented in 1792. He was also a master of both intelligence and deception and had an uncanny sense of when to strike. He often won battles by concentrating his forces on an unsuspecting enemy by using spies to gather information about opposing forces and by concealing his own troop deployments. In this campaign, often considered his greatest, Napoleon's army captured 160,000 prisoners, two thousand cannons, and 170 standards. A year of campaigning had witnessed major breaks with the traditional norms of eighteenth-century warfare and marked a new era in military history. While campaigning in Italy, General Bonaparte became increasingly influential in French politics. He published two newspapers, ostensibly for the troops in his army, but widely circulated within France as well. In May 1797 he founded a third newspaper, published in Paris, entitled Le Journal de Bonaparte et des hommes vertueux. Elections in mid-1797 gave the royalist party increased power, alarming Barras and his allies on the Directory. 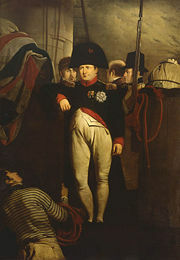 The royalists, in turn, began attacking Bonaparte for looting Italy and overstepping his authority in dealings with the Austrians. Bonaparte sent General Pierre François Charles Augereau to Paris to lead a coup d'etat and purge the royalists on September 4 (18 Fructidor). This left Barras and his Republican allies in firm control again, but dependent on Bonaparte's military command to stay there. Bonaparte himself proceeded to the peace negotiations with Austria, and then returned to Paris in December as the conquering hero and the dominant force in government, far more popular than any of the Directors. In March 1798, Bonaparte proposed a military expedition to seize Egypt, then a province of the Ottoman Empire, seeking to protect French trade interests and undermine Britain's access to India, although the real reason for this invasion remains under debate. The Directory, although troubled by the scope and cost of the enterprise, readily agreed to the plan in order to remove the popular general from the center of power. An unusual aspect of the Egyptian expedition was the inclusion of a large group of scientists assigned to the invading French force: among the other discoveries that resulted, the Rosetta Stone was found. Some consider this deployment of intellectual resources an indication of Bonaparte's devotion to the principles of the Enlightenment, and by others as a masterstroke of propaganda obfuscating the true imperialist motives of the invasion. In a largely unsuccessful effort to gain the support of the Egyptian populace, Bonaparte also issued proclamations casting himself as a liberator of the people from Ottoman oppression, and praising the precepts of Islam. Bonaparte's expedition seized Malta from the Knights of Saint John on June 9 and then landed successfully at Alexandria on July 1, eluding (temporarily) pursuit by the British Royal Navy. After landing on the coast of Egypt, the first battle to take place was against the Mamluks, an old power in the Middle East, approximately four miles from the pyramids. 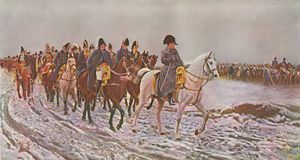 Bonaparte's forces were greatly outnumbered by the advanced cavalry, about 25,000 to 100,000, but Bonaparte came out on top, mainly due to his strategy. In all, only three hundred French were killed, while approximately six thousand native Egyptians were killed. While the battle on land was a resounding victory for the French, the British navy managed to compensate at sea. The ships that had dropped off Bonaparte and his army had sailed back to France, but a fleet of battleships that had come with them stayed and supported the army along the coast. On August 1, The British fleet found these battleships anchored in a strong defensive position in the bay of Abukir. The French believed that they were open to attack only on one side, the other side being protected by the shore. However, the arriving British fleet under Horatio Nelson managed to slip half of their ships in between the land and the French line, thus attacking from both sides. All but two of the French vessels were captured or destroyed. Only the Guillaume Tell with Rear Admiral [Pierre-Charles Villeneuve and the Généreux escaped. The Guillaume Tell was caught not much later in the course of the British conquest of Malta. Many blame the French loss in this Battle of the Nile on the French admiral Francois-Paul Brueys, who came up with the failed defensive strategy. However, the French ships were also undermanned, the officers were demoralized, and Nelson's attack was a surprise. In all, about 250 British and 1,700 French were killed. Bonaparte became land-bound. His goal of strengthening the French position in the Mediterranean Sea was thus frustrated, but his army nonetheless succeeded in consolidating power in Egypt, although it faced repeated nationalist uprisings. In early 1799 he led the army into the Ottoman province of Syria, now modern Israel, and defeated numerically superior Ottoman forces in several battles, but his army was weakened by disease and poor supplies. He was unable to reduce the fortress of Acre, and was forced to return to Egypt in May. In order to speed up the retreat, Bonaparte took the controversial step of killing prisoners and plague-stricken men along the way. His supporters have argued that this decision was necessary given the continuing harassment of stragglers by Ottoman forces. Back in Egypt, on July 25, Bonaparte defeated an Ottoman amphibious invasion at Battle of Abukir. This partially redressed his reputation from the naval defeat there a year earlier. With the Egyptian campaign stagnating, and political instability developing back home, Bonaparte abandoned Egypt for Paris in august 1799, leaving his troops behind under Marshal Jean Baptiste Kléber. It has been suggested that Sir Sidney Smith and other British commanders in the Mediterranean helped Bonaparte evade the British blockade, thinking that he might act as a Royalist element back in France, but there's no solid evidence in support of this argument. The remaining troops, angry at Bonaparte and the French government for having left them behind, were supposed to be honorably evacuated under the terms of a treaty Kleber had negotiated with Smith in early 1800. However, British Admiral Keith reneged on this treaty and sent an amphibious assault force of 30,000 Mamelukes against Kleber. The Mamelukes were defeated at the battle of Heliopolis in March 1800, and Kleber then suppressed an insurrection in Cairo. 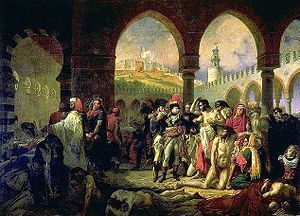 But Kleber was assassinated in June 1800 by a Syrian student, and command of the French army went to general Menou. Menou held command until August 1801, when, under continual harassment by British and Ottoman forces, and after the loss of 13,500 men (mostly to disease), he eventually capitulated to the British. Under the terms of his surrender, the French army was repatriated in British ships, along with a priceless hoard of Egyptian antiquities. While in Egypt, Bonaparte tried to keep a close eye on European affairs, relying largely on newspapers and dispatches that arrived only irregularly. On August 23, 1799, he abruptly set sail for France, taking advantage of the temporary departure of British ships blockading French coastal ports. Although he was later accused by political opponents of abandoning his troops, his departure actually had been ordered by the Directory, which had suffered a series of military defeats to the forces of the Second Coalition, and feared an invasion. By the time he returned to Paris in October, the military situation had improved due to several French victories. The Republic was bankrupt, however, and the corrupt and inefficient Directory was more unpopular with the French public than ever. Bonaparte was approached by one of the Directors, Emmanuel Joseph Sieyès, seeking his support for a coup to overthrow the French Constitution of 1795. The plot included Bonaparte's brother Lucien, then serving as speaker of the Council of Five Hundred, Roger Ducos, another Director, and Charles Maurice de Talleyrand. On November 9 and 10, troops led by Bonaparte seized control and dispersed the legislative councils, leaving a rump to name Bonaparte, Sieyès, and Ducos as provisional Consuls to administer the government. Although Sieyès expected to dominate the new regime, he was outmaneuvered by Bonaparte, who drafted the Constitution of the Year VIII and secured his own election as first consul. This made him the most powerful person in France, a power that was increased by the Constitution of the Year X, which made him first consul for life. Bonaparte instituted several lasting reforms including centralized administration of the départements, higher education, a tax system, a central bank, law codes, and road and sewer systems. His set of civil laws, the Napoleonic Code or Civil Code, has importance to this day in many countries. The Code was prepared by committees of legal experts under the supervision of Jean Jacques Régis de Cambacérès, who held the office of second consul from 1799 to 1804; Bonaparte, however, participated actively in the sessions of the Conseil d'État (Council of State) that revised the drafts. Other codes were commissioned by Bonaparte to codify criminal and commerce law. In 1808 a Code of Criminal Instruction was published, which enacted precise rules of judicial procedure. Although contemporary standards may consider these procedures as favoring the prosecution, when enacted they sought to preserve personal freedoms and to remedy the prosecutorial abuses commonplace in European courts. Napoleon negotiated the Concordat of 1801 with the papacy, seeking to reconcile the mostly Catholic population with his regime. The French Revolution had established a secular regime, replaced the Gregorian calendar, and embarked on a policy of de-Christianization. Fifty anti-government bishops were in exile in England, and what was left of the church in France was alienated or hostile—yet most common citizens were believers. Napoleon believed that religion was necessary for social order and sought to strike a deal to the papacy that would bring the bishops in line. He saw restoration of the church as politically expedient, he said he was a Muslim when he ruled Egypt, and proclaimed himself a Catholic in France. The Concordat sanctioned the sale of ecclesiastical properties, reapportioned dioceses, demanded resignation of the whole French episcopate, and mandated recognition of new clergy, nominated by Napoleon, installed by the Pope, and paid by the State. The Concordat gave more power over the Church to the State, but Napoleon underestimated its effect. Religious leaders routinely ignored his requests, and Cardinal Conslavi negotiated a more favorable Concordat for Italy in 1803. 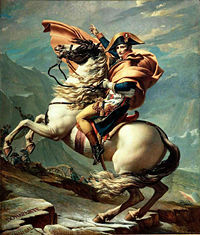 Napoléon crossing the Alps, by Jacques-Louis David. Notice the names of Hannibal, Charlemagne (Karolus Magnus), and Bonaparte in the rocks below. In 1800 Bonaparte returned to Italy, which the Austrians had reconquered during his absence in Egypt. He and his troops crossed the Alps in spring (although he actually rode a mule, not the white charger on which Jacques-Louis David famously depicted him). While the campaign began badly, the Austrians were eventually routed in June at Marengo, leading to an armistice. Napoleon's brother Joseph, who was leading the peace negotiations in Lunéville, reported that due to British backing for Austria, Austria would not recognize France's newly gained territory. As negotiations became more and more fractious, Bonaparte gave orders to his general, Jean Victor Marie Moreau, to strike Austria once more. Moreau led France to victory at Hohenlinden. As a result, the Treaty of Lunéville was signed in February 1801, under which the French gains of the Treaty of Campo Formio were reaffirmed and increased; the British signed the Treaty of Amiens in March 1802, which set terms for peace, including the division of several colonial territories. The peace between France and Britain was uneasy and short-lived. The monarchies of Europe were reluctant to recognize a republic, fearing that the ideas of the revolution might be exported to them. In Britain, the brother of Louis XVI was welcomed as a state guest although officially Britain recognized France as a republic. Britain failed to evacuate Malta and Egypt as promised, and protested against France's annexation of Piedmont, and Napoleon's Act of Mediation in Switzerland (although neither of these areas was covered by the Treaty of Amiens). In 1803 Bonaparte faced a major setback when an army he sent to reconquer Haiti and establish a base was destroyed by a combination of yellow fever and fierce resistance led by Toussaint L'Ouverture. Recognizing that the French possessions on the mainland of North America would now be indefensible, and facing imminent war with Britain, he sold them to the United States—the Louisiana Purchase—for less than three cents per acre ($7.40 per square kilometer). The dispute over Malta provided the pretext for Britain to declare war on France in 1803 to support French royalists. In January 1804, Bonaparte's police uncovered an assassination plot against him, ostensibly sponsored by the House of Bourbon. In retaliation, Bonaparte ordered the arrest of the Louis-Antoine-Henri de Bourbon-Condé, duc d'Enghien, in a violation of the sovereignty of Baden. After a hurried secret trial, the Duke was executed on March 21. Bonaparte then used this incident to justify the re-creation of a hereditary monarchy in France, with himself as emperor, on the theory that a House of Bourbon restoration would be impossible once the Bonapartist succession was entrenched in the constitution. 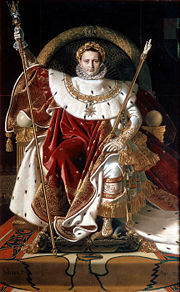 Bonaparte crowned himself emperor on December 2, 1804, at Notre Dame de Paris. Claims that he seized the crown out of the hands of Pope Pius VII during the ceremony in order to avoid subjecting himself to the authority of the pontiff are apocryphal; in fact, the coronation procedure had been agreed upon in advance. 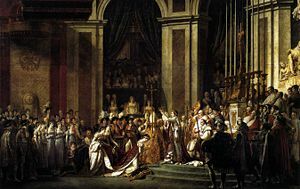 After the Imperial regalia had been blessed by the Pope, Napoleon crowned himself before crowning his wife Joséphine as Empress (the moment depicted in David's famous painting, illustrated at right). The Pope had expected Italy in return, and was frustrated when Napoleon insisted on being crowned king of Italy with the Iron Crown of Lombardy at Milan's cathedral on May 26, 1805. By 1805 Britain was unwillingly drawn to a Third Coalition against Napoleon, after he made it clear that he wouldn't stop his expansive wars in the continent. 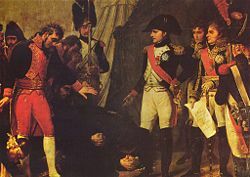 Napoleon knew the French fleet could not defeat the Royal Navy, and therefore arranged to lure the British fleet away from the English Channel so that, in theory, a Spanish and French fleet could regain control of the Channel for 24 hours, which he erroneously thought enough for French armies to cross to England. 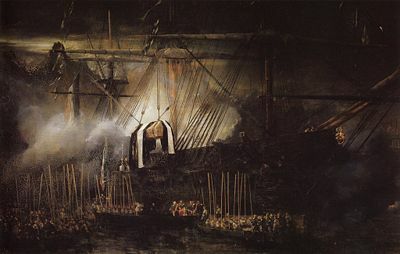 Napoleon was wholly ignorant of nautical matters; his orders to admirals were often contradictory or useless, and the fleet of rafts he prepared was destined to sink in the Channel, or take at least three days to take his army to the English coast, even if any other ships did not harass it. Napoleon's fleet was also defenseless. However, with Austria and Russia preparing an invasion of France and its allies, he had to change his plans and turn his attention to the continent. The newly born Grande Armee secretly marched towards Germany. On October 20, 1805 it surprised the Austrians at Ulm. The next day, however, at the decisive Battle of Trafalgar (October 21, 1805), Britain gained lasting control of the seas. A few weeks later, Napoleon secured a major victory against Austria and Russia at Austerlitz, a decisive victory he would be most proud of in his military career (December 2; the one-year anniversary of his coronation), forcing Austria yet again to sue for peace. A Fourth Coalition was assembled the following year, and Napoleon defeated Prussia at the Battle of Jena-Auerstedt (October 14, 1806). He marched on against advancing Russian armies through Poland, and was attacked at the bloody Battle of Eylau on February 6, 1807. After a decisive victory at Friedland he signed a treaty at Tilsit in East Prussia with Tsar Alexander I of Russia, dividing Europe between the two powers. He placed puppet rulers on the thrones of German states, including his brother Jerome as king of the new state of Kingdom of Westphalia. In the French-controlled part of Poland, he established the Duchy of Warsaw with King Frederick Augustus I of Saxony as ruler. Between 1809 and 1813, Napoleon also served as Regent of the Grand Duchy of Berg for his brother Louis Bonaparte. Ludwig van Beethoven initially dedicated his third symphony, the Symphony No. 3 (Eroica - Italian for "heroic"), to Napoleon in the belief that the general would sustain the democratic and republican ideals of the French Revolution, but in 1804, as Napoleon's imperial ambitions became clear, renamed the symphony as the "Sinfonia Eroica, composta per festeggiare il Sovvenire di un grand'Uomo", or in English, "composed to celebrate the memory of a great man." In addition to military endeavors against Britain, Napoleon also waged economic war, attempting to enforce a Europe-wide commercial boycott of Britain called the "Continental System." Although this action hurt the British economy, it also damaged the French economy and was not a decisive factor. Portugal did not comply with this Continental System and in 1807 Napoleon sought Spain's support for an invasion of Portugal. When Spain refused, Napoleon invaded Spain as well. After mixed results were produced by his generals, Napoleon himself took command and defeated the Spanish army, retook Madrid and then defeated a British army sent to support the Spanish, driving it to the coast and forcing withdrawal from the Iberian peninsula (in which its commander, Sir John Moore, was killed). Napoleon installed one of his marshals and brother-in-law, Joachim Murat, as the king of Naples, and his brother Joseph Bonaparte, as king of Spain. The Spanish, inspired by nationalism and the Roman Catholic Church, and angry over atrocities committed by French troops, rose in revolt. At the same time, Austria unexpectedly broke its alliance with France and Napoleon was forced to assume command of forces on the Danube and German fronts. A bloody draw ensued at Aspern-Essling (May 21–22, 1809) near Vienna, which was the closest Napoleon ever came to a defeat in a battle with more or less equal numbers on each side. After a two-month interval, the principal French and Austrian armies engaged again near Vienna resulting in a French victory at Battle of Wagram (July 6). Following this, a new peace was signed between Austria and France—and in the following year the Austrian Archduchess Marie Louise, Duchess of Parma married Napoleon, following his divorce of Josephine. Although the Congress of Erfurt had sought to preserve the Russo-French alliance, by 1811 tensions were again increasing between the two nations. Although Alexander and Napoleon had a friendly personal relationship since their first meeting in 1807, Alexander had been under strong pressure from the Russian aristocracy to break off the alliance with France. Had Russia withdrawn without France doing anything the other countries would have followed suit and revolted against Napoleon. Thus it was necessary to show that France would respond. The first sign that the alliance was deteriorating was the easing of the application of the Continental System in Russia, angering Napoleon. By 1812 advisors to Alexander suggested the possibility of an invasion of the French Empire (and the recapture of Poland). Large numbers of troops were deployed to the Polish borders (reaching over 300,000 out of the total Russian army strength of 410,000). After receiving the initial reports of Russian war preparations, Napoleon began expanding his Grande Armée to a massive force of over 450,000-600,000 men (despite already having over 300,000 men deployed in Iberia). Napoleon ignored repeated advice against an invasion of the vast Russian heartland, and prepared his forces for an offensive campaign. On June 22, 1812, Napoleon's invasion of Russia commenced. Napoleon, in an attempt to gain increased support from Polish nationalists and patriots, termed the war the "Second Polish War" (the first Polish war being the liberation of Poland from Russia, Prussia and Austria). Polish patriots wanted the Russian part of partitioned Poland to be incorporated into the Grand Duchy of Warsaw and a new Kingdom of Poland created, although this was rejected by Napoleon, who feared it would bring Prussia and Austria into the war against France. Napoleon also rejected requests to free the Russian serfs, fearing this might provoke a conservative reaction in his rear. The Russians under Mikhail Bogdanovich Barclay de Tolly ingeniously avoided a decisive engagement that Napoleon longed for, preferring to retreat ever deeper into the heart of Russia. A brief attempt at resistance was offered at Smolensk (August 16-17), but the Russians were defeated in a series of battles in the area and Napoleon resumed the advance. The Russians then repeatedly avoided battle with the Grande Armée, although in a few cases only because Napoleon uncharacteristically hesitated to attack when the opportunity presented itself. Criticized over his tentative strategy of continual retreat, Barclay was replaced by Mikhail Illarionovich Kutuzov, although he continued Barclay's strategy. Kutuzov eventually offered battle outside Moscow on September 7. Losses were nearly even for both armies, with slightly more casualties on the Russian side, after what may have been the bloodiest day of battle in history—the Battle of Borodino. Although Napoleon was far from defeated, the Russian army had accepted and withstood the major battle the French hoped would be decisive. After the battle, the Russian army withdrew and retreated past Moscow. The Russians retreated and Napoleon was able to enter Moscow, assuming that the fall of Moscow would end the war and that Alexander I would negotiate peace. However, on orders of the city's military governor and commander-in-chief, Fyodor Rostopchin, rather than capitulating, Moscow was ordered burned. Within the month, fearing loss of control back in France, Napoleon left Moscow. The French suffered greatly in the course of a ruinous retreat; the Army had begun as over 650,000 frontline troops, but in the end fewer than 40,000 crossed the Berezina River (November 1812) to escape. In total French losses in the campaign were 570,000 against about 400,000 Russian casualties and several hundred thousand civilian deaths. There was a lull in fighting over the winter of 1812–13 whilst both the Russians and the French recovered from their massive losses. A small Russian army harassed the French in Poland and eventually 30,000 French troops there withdrew to the German states to rejoin the expanding force there, numbering 130,000 with the reinforcements from Poland. This force continued to expand, with Napoleon aiming for a force of 400,000 French troops supported by a quarter of a million German troops. Heartened by Napoleon's losses in Russia, Prussia soon rejoined the Coalition that now included Russia, the United Kingdom, Spain, and Portugal. Napoleon assumed command in Germany and soon inflicted a series of defeats on the Allies culminating in the Battle of Dresden on August 26-27, 1813, causing almost 100,000 casualties to the Coalition forces (the French sustaining only around 30,000). Despite these initial successes, however, the numbers continued to mount against Napoleon as Sweden and Austria joined the Coalition. Eventually the French army was pinned down by a force twice its size at the Battle of Nations (October 16-19) at Leipzig. Some of the German states switched sides in the midst of the battle, further undermining the French position. This was by far the largest battle of the Napoleonic Wars and cost both sides a combined total of over 120,000 casualties. After this Napoleon withdrew in an orderly fashion back into France, but his army was now reduced to less than 100,000 against more than half a million Allied troops. The French were now surrounded (with British armies pressing from the south in addition to the Coalition forces moving in from the German states) and vastly outnumbered. The French armies could only delay an inevitable defeat. Paris was occupied on March 31, 1814. At the urging of his marshals, Napoleon abdicated on April 6, in favor of his son. The Allies, however, demanded unconditional surrender and Napoleon abdicated again, unconditionally, on April 11. In the Treaty of Fontainebleau the victors exiled him to Elba, a small island in the Mediterranean Sea, 20 kilometers off the coast of Italy. In France, the royalists had taken over and restored King Louis XVIII to power. Separated from his wife and son (who had come under Austrian control), cut off from the allowance guaranteed to him by the Treaty of Fontainebleau, and aware of rumors that he was about to be banished to a remote island in the Atlantic, Napoleon escaped from Elba on February 26, 1815 and returned to the mainland on March 1, 1815. King Louis XVIII sent the Fifth Regiment, led by Marshal Michel Ney who had formerly served under Napoleon in Russia, to meet him at Grenoble on March 7, 1815. Napoleon approached the regiment alone, dismounted his horse and, when he was within earshot of Ney's forces, shouted "Soldiers of the Fifth, you recognize me. If any man would shoot his emperor, he may do so now." Following a brief silence, the soldiers shouted "Vive L'Empereur!" and marched with Napoleon to Paris. He arrived on March 20, quickly raising a regular army of 140,000 and a volunteer force of around 200,000 and governed for one hundred days. Napoleon's final defeat came at the hands of the Arthur Wellesley, Duke of Wellington and Gebhard Leberecht von Blücher at the Battle of Waterloo in present-day Belgium on June 18, 1815. Off the port of Rochefort, Charente-Maritime, Napoléon made his formal surrender while on board HMS Bellerophon on July 15, 1815. Napoleon was imprisoned and then exiled by the British to the island of Saint Helena (2,800 kilometers off the Bight of Guinea in the South Atlantic Ocean) from October 15, 1815. While there, with a small cadre of followers, he dictated his memoirs and criticized his captors. Sick for much of his time on Saint Helena, Napoleon died on May 5, 1821. His last words were: "France, the Army, head of the Army, Josephine.” His heritage was distributed to his close followers like the General Marbot, whom he asked to continue his writings on the "Grandeur de la France." Napoleon had asked in his will to be buried on the banks of the Seine, but was buried on Saint Helena. 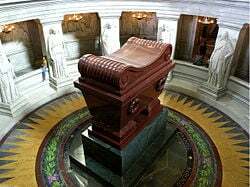 In 1840 his remains were taken to France in the frigate Belle-Poule and entombed in Les Invalides, Paris. Hundreds of millions have visited his tomb since that date. The cause of Napoleon's death has been disputed on numerous occasions, and the controversy remains to this day. Francesco Antommarchi, Napoleon's personal physician, gave stomach cancer as a reason for Napoleon's death in his death certificate. In 1955 the diaries of Louis Marchand, Napoléon's valet, appeared in print. He describes Napoleon in the months leading up to his death, and led many—most notably Sten Forshufvud and Ben Weider—to conclude that he had been killed by arsenic poisoning. Arsenic was at the time sometimes used as a poison as it was undetectable when administered over a long period of time. Arsenic was also used in some wallpaper, as a green pigment, and even in some patent medicines. As Napoleon's body was found to be remarkably well preserved when it was moved in 1840, it gives support to the arsenic theory, as arsenic is a strong preservative. In 2001 Pascal Kintz, of the Strasbourg Forensic Institute in France, added credence to this claim with a study of arsenic levels found in a lock of Napoleon's hair preserved after his death: they were seven to 38 times higher than normal. Cutting up hairs into short segments and analyzing each segment individually provides a histogram of arsenic concentration in the body. This analysis on hair from Napoleon suggests that large but non-lethal doses were absorbed at random intervals. The arsenic severely weakened Napoleon and remained in his system. 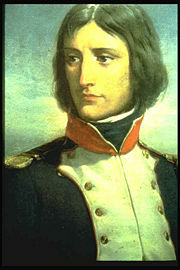 More recent analysis on behalf of the magazine Science et Vie showed that similar concentrations of arsenic can be found in Napoleon's hair in samples taken from 1805, 1814 and 1821. The lead investigator, Ivan Ricordel (head of toxicology for the Paris Police), stated that if arsenic had been the cause, Napoleon would have died years earlier. The group suggested that the most likely source in this case was a hair tonic. Prior to the discovery of antibiotics, arsenic was also a widely used, but ineffective, treatment for syphilis. This has led to speculation that Napoleon might have suffered from that disease. The medical regime imposed on Napoleon by his doctors included treatment with antimony potassium tartrate, regular enemas and a 600-milligram dose of mercuric chloride to purge his intestines in the days immediately prior to his death. In May 2005, a team of Swiss physicians claimed that the reason for Napoleon's death was stomach cancer, which was also the cause of his father's death. From a multitude of forensic reports they derive that Napoleon weighed approximately 76 kilograms (168 pounds) at his death, while a year earlier he weighed approximately 91 kilograms (200 pounds), confirming the autopsy result reported by Antommarchi. A team of physicians from the University of Monterspertoli led by Professor Biondi recently confirmed this. March 9, 1796, to Joséphine de Beauharnais. He formally adopted her son, Eugène de Beauharnais, and cousin, Stéphanie de Beauharnais, after assuming the throne to arrange "dynastic" marriages for them. He had her daughter, Hortense, marry his brother, Louis. Though their marriage was unconventional and both were known to have many affairs, the couple was ultimately devoted to each other, and when Joséphine agreed to divorce so he could remarry in the hopes of producing an heir, it was devastating for both. It was also the first under the Napoleonic Code. March 11, 1810, by proxy to Archduchess Marie Louise of Austria, then in a ceremony on April 1. They remained married until his death, although she did not join him in his exile. Napoleon Francis Joseph Charles (March 20, 1811 – July 22, 1832), King of Rome. Known as Napoleon II of France, although he never ruled. Was later known as the Duke of Reichstadt. He had no issue. Napoleon is credited with introducing the concept of the modern professional conscript army to Europe, an innovation that other states eventually followed. He did not introduce many new concepts into the French military system, borrowing mostly from previous theorists and the implementations of preceding French governments, but he did expand or develop much of what was already in place. Corps replaced divisions as the largest army units, artillery was integrated into reserve batteries, the staff system became more fluid, and cavalry once again became a crucial formation in French military doctrine. Napoleon's biggest influence in the military sphere was in the conduct of warfare. Weapons and technology remained largely static through the Revolutionary and Napoleonic eras, but eighteenth-century operational strategy underwent massive restructuring. Sieges became infrequent to the point of near-irrelevance, a new emphasis towards the destruction, not just outmaneuvering, of enemy armies emerged, and invasions of enemy territory occurred over broader fronts, thus introducing a plethora of strategic opportunities that made wars costlier and, just as importantly, more decisive. Defeat for a European power now meant much more than losing isolated enclaves; near-Carthaginian peaces intertwined whole national efforts, sociopolitical, economic, and militaristic, into gargantuan collisions that severely upset international conventions as understood at the time. It can be argued that Napoleon's initial success sowed the seeds for his downfall. Not used to such catastrophic defeats in the rigid power system of eighteenth-century Europe, many nations found existence under the French yoke difficult, sparking revolts, wars, and general instability that plagued the continent until 1815. In France, Napoleon is seen by some as having ended lawlessness and disorder in France, and the wars he fought as having served to export the Revolution to the rest of Europe. The movements of national unification and the rise of the nation state, notably in Italy and Germany, may have been precipitated by the Napoleonic rule of those areas. His religious policy emancipated Protestants to an equal status with Catholics, and the Concordat of 1801 contained principles workable enough for France for the next one hundred years. The Napoleonic Code was adopted throughout much of Europe and remained in force after Napoleon's defeat. Professor Dieter Langewiesche of the University of Tübingen describes the code as a "revolutionary project" which spurred the development of bourgeois society in Germany by expanding the right to own property and breaking the back of feudalism. Langewiesche also credits Napoleon with reorganizing what had been the Holy Roman Empire made up of more than one thousand entities into a more streamlined network of 40 states providing the basis for the German Confederation and the future unification of Germany under the German Empire in 1871. Some regard this as indirectly causing two World Wars. Napoleon extended French influence, including to the Arab world through his invasion of Egypt, which was subsequently drawn into European politics. In mathematics, Napoleon is traditionally given credit for discovering and proving Napoleon's theorem, although there is no specific evidence that he did so. The theorem states that if equilateral triangles are constructed on the sides of any triangle (all outward or all inward), the centers of those equilateral triangles themselves form an equilateral triangle. After all, the military record is unquestioned—17 years of wars, perhaps six million Europeans dead, France bankrupt, her overseas colonies lost. And it was all such a great waste, for when the self-proclaimed tête d'armée was done, France's "losses were permanent" and she "began to slip from her position as the leading power in Europe to second-class status—that was Bonaparte's true legacy. Napoleon was in many ways the direct inspiration for later autocrats: he never flinched when facing the prospect of war and destruction for thousands, friend or foe, and turned his search of undisputed rule into a continuous cycle of conflict throughout Europe, ignoring treaties and conventions alike. Even if other European powers continuously offered Napoleon terms that would have restored France's borders to situations only dreamed by the Bourbon kings, he always refused compromise, and only accepted surrender. Nevertheless, many in the international community still admire the many accomplishments of the emperor, as evidenced by the International Napoleonic Congress held in Dinard, France, in July 2005, that included participation by members of the French and American military, French politicians, scholars from as far away as Israel and Russia, and a parade recreating the Grand Army. to make it a law that only those lawyers and attorneys should receive fees who had won their cases. How much litigation would have been prevented by such a measure! For it is quite obvious that there is not a lawyer who, after a first look at the case, would not turn it down if it seemed doubtful. It need not be feared that a man who earns his living from his work might take on a case for the simple pleasure of hearing himself talk; yet even if he did, he would harm no one but himself . . . I am convinced to this day that the idea is brilliant. Contrary to popular belief, Napoleon was actually slightly taller than an average Frenchman of the nineteenth century. 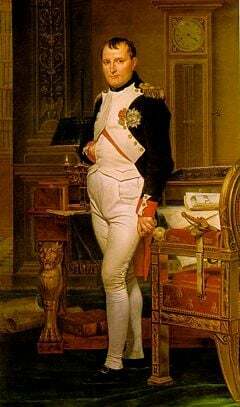 After his death in 1821, the French emperor's height was recorded as five feet two inches using French units, corresponding to five feet, 6.5 inches (1.69 meters) using Imperial units. A French inch was 2.71 centimeters  while an Imperial inch is 2.54 centimeters. The metric system was introduced during the French First Republic, but was not in widespread use until after Napoleon's death. In addition to this miscalculation, his nickname le petit caporal adds to the confusion, as non-francophones mistakenly take petit literally as meaning "small"; in fact, it is an affectionate term reflecting on his camaraderie with ordinary soldiers (for example, petit(e) ami(e) means "boyfriend" (without 'e's) and "girlfriend" (with 'e's) in French). He also surrounded himself with the soldiers of his elite guard, who were always six feet tall or taller. ↑ Cronin 1994, 20-21; McLynn 1998, 8. ↑ Beauterne, Chevalier de. Sentiment de Napoleon ler sur le Christianisme. Paris: A. Bray, 1860. p. 17. "Je suis catholique et je mantiens le catholicism en France, parce ceque c'est la vrai religion, parce que c'est le religion de la France." ↑ Perrodo-Le Moyne, Henri. Napoleon devant les Religions. Paris: Le Pavillion, 1970. p. 18. ↑ Allen F. Chew, Fighting the Russians in Winter: Three Case Studies Retrieved April 27, 2015. ↑ Napoleon's Theorem. Retrieved December 18, 2005..
↑ Victor Davis Hanson, The Little Tyrant, A review of Napoleon: A Penguin Life, by Paul Johnson. The Claremont Institute, June 3, 2003. Retrieved April 27, 2015. The quoted passages within this text are from Johnson. ↑ How Tall Was Napoleon?. Retrieved December 18, 2005..
↑ Herbert Arthur Klein, The Science of Measurement: A Historical Survey Retrieved April 27, 2015. Gautier, A. Un drogman à Sainte-Hélène, le baron Barthélémi de Stürmer (1787-1863), Le Bulletin, Association des anciens élèves, Institut National des Langues et Civilisations Orientales (INALCO)(National Institute of Languages and Oriental Civilizations), October 2003, 39-48. The Napoleon Series - Acknowledging the extraordinary talents of the man who defined an age (1789-1821) and the remarkable men and women who peopled and shaped it, the Napoleon Series seeks to promote the continued, scholarly exploration of that age. This page was last modified on 6 November 2018, at 19:36.